I did not cook tonight. We ordered in sandwiches from a local sandwich shop in Park Slope. However, tomorrow, I will be preparing a pasta dish. However, I figured that tonight would be a good time to discuss some of the homemade pizza variations I have tried over the summer and fall. You can really put anything on pizza. I love pizza with different and interesting variations. There are a lot of great pizza places here in New York. Some of my favorites are: Grimaldi's, Keste and Otto Enoteca. The first step in making pizza is making a tasty crust. I have not experimented with a lot of crust variations, but have simply been working with a very basic crust formula. I have, however, experimented with different types of flours - including regular all-purpose flour and a mixture of all-purpose flour with whole white flour to make a whole white pizza crust. In addition, pizza crust preparation, like most bread preparation, requires using dry active yeast, so you should plan on allowing an extra hour for your crust to rise. To prepare the crust, add the warm water, dry active yeast, oil, sugar and salt to a bowl and whisk together. Allow to sit for about 10 minutes, until the yeast foams and is "activated." Add flour and mix. Transfer to a bowl coated in canola oil and allow to sit, covered with either plastic wrap or a warm dishtowel for 1 hour, until the dough doubles in size. After the dough doubles, prepare your crusts. You can divide into 4 pieces and stretch with your hands and flatten until you have 4 smaller pizzas, or you can make 1 or 2 larger ones. You can freeze the extra crusts until you are ready to use them. 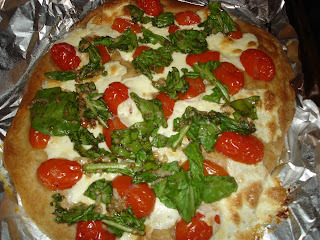 Cut up grape tomatoes and use to top the pizza. You can use as many or as few as you like. I then used freshly made mozzarella from M&S prime meats in Park Slope, where they make fresh mozzarella daily. The I baked the pies at 450 F for about 15-20 minutes until done. 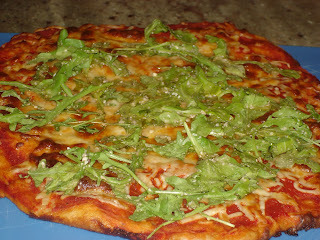 While the pies cooked, I mixed the arugula with some pecorino cheese and 2 T of balsamic vinegar. Then, I topped the pies with this mixture and baked for about 1 minute, just enough for the arugula to wilt. First top with the tomatoes and goat cheese, Add some sliced and sauteed red onions and bake at 450 F for 15-20 minutes. Same as variation 1, but use a can of tomato sauce instead of grape tomatoes. Just a few notes for pizza makers - get a pizza stone if you don't have one - it makes all the difference for a crisp crust. The hardest part is getting the uncooked pizza onto the stone to cook it, but one secret is that a failed pizza becomes an excellent calzone.